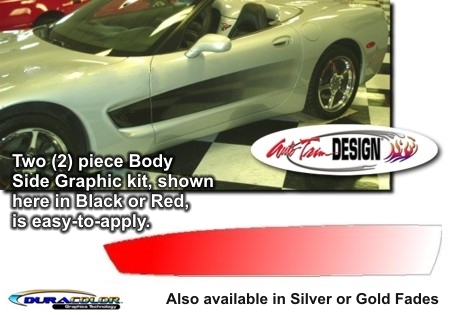 Add a unique look to your '97-'04 Chevrolet Corvette C5 Coupe, Convertible or Z06! These awesome body side graphics are designed to fit perfectly within your Vette's depressed vent area as shown. Starting as solid at the front vent, the graphics gently fade to your vehicle's paint scheme to the back. Measuring 64.012"x 9.696" (162.59cm x 24.63cm), these graphics are available in five (5) fade colors. Very easy to install. Only requires slight trimming at front door jambs.